As official Journal of the Associazione Allergologi Immunologi Italiani Territoriali e Ospedalieri (Italian Association of Hospital Allergists and Immunologists - AAIITO) and of the Sociedade Portuguesa de Alergologia e Imnunologia Clinica (Portuguese Society of Allergology and Clinical Immunology - SPAIC), it collects reviews, original works and case reports concerning etiology, diagnosis and treatment of allergic and immunological disorders. It includes a section of information coming from the main international health associations and authorities. 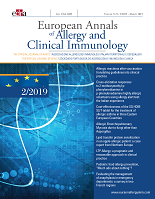 European Annals of Allergy and Clinical Immunology represents to the specialist a means for updating and widening in research and clinical practice field. The contents of this Journal are indexed in PubMed and Scopus. » Pediatric food allergy prevention,"Much ado about nothing"?